The human rights approach requires you to see poverty in broader terms than just income, consider the dignity of people living in poverty, and recognize the vast range of experiences of people living in poverty. 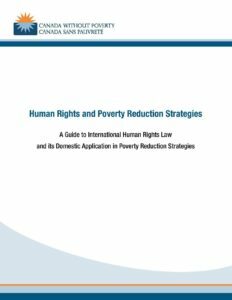 CWP is pleased to announce our latest publication: Human Rights and Poverty Strategies, A Guide to International Human Rights Law and its Domestic Application in Poverty Reduction Strategies. For over 4.8 million people in Canada every day, poverty is a reality; a struggle to find employment, to pay rent, to put food on the table and to generally make ends meet. Poverty is defined at an international level as the denial of fundamental human rights that are inherent to every person. Check out the full guide below. If you have questions about the Guide and whether it can be used in your community, please email Michele at michele[at]cwp-csp.ca. We are grateful for the generous support by the Law for the Future Fund of the Canadian Bar Association for this project.